I sadly stared at the computer, something kept on playing in my mind. Slowly I closed the computer and continued to look at the black screen in front of me. “Come to bed,” a man’s voice said. I immediately stood up and went straight to bed. As I slowly felt his hand touch my waist, a frightening feeling traveled all over my body. He knew what I was really feeling but just decided to stay quiet. He was afraid that if he continued to ask, he might end up getting an answer that he will never understand. “Jae,” I uttered his name softly. “Uhmm…what is it?” he gently asked. “We need to talk,” I said as I tried to gather all the courage I had. “About what?” he asked as he slowly shifted his body and gently held me closer to him. “I, I…” I started to mumble. “What?” he suddenly asked curiously. “I think we should break up,” I replied hastily. He suddenly sat on the bed. “What’s wrong? Why are you suddenly breaking up with me?” he asked with his eyes filled with confusion. “I’m not happy anymore,” I simply replied as I also sat on the bed and faced him. “What then? Have I done something wrong?” he asked again. “I’m already in love with… someone else,” I answered. “Who?” Jaejoong asked with tears already streaming down his face. “No!” he angrily shouted as he grabbed the figurine he had given me on our very first date and threw it at the wall. I started to sob uncontrollably. “I’m sorry,” I uttered. “Why? Why are you doing this to me? I thought you said you loved me?” he asked as he cried uncontrollably. Somehow my heart was already bleeding. I wanted to embrace him and comfort him. But it was better this way. He needed to learn how to live without me. As I slowly left the room, my heart was already shattered into a million pieces. “Jaejoong, what are you looking at?” Yunho asked. Their van was passing by a house that somehow looked familiar to him. He didn’t know why but his heart and mind was telling him that it looked so familiar. He quickly asked the driver to stop. He was already staring in front of the house for more than several minutes when a man came out of the house. “Can I do something for you, young man?” the man asked. “I was just admiring your house sir. Somehow I have the feeling that I have seen it somewhere,” Jaejoong politely answered. “I remember the painter’s name is Lena,” the old man tried to tell Jaejoong. Eyes wide with shock, Jaejoong quickly turned to face the old man. “Did you say Lena?” he asked with disbelief. Jaejoong felt his world was slowly turning and then it quickly stopped that he lost his balance. Yunho, who was standing beside him immediately grabbed him and helped him to his feet. Yunho looked at Jaejoong. He was obviously not himself anymore. “Sir, we would really appreciate it if you could give us the details of that site you are referring to,” Yunho said politely to the man. The man stared at Jaejoong, as if wondering what was going on. He then nodded his head and went into his house again. After several minutes, the old man came out with a piece of paper in his hand. “Here. 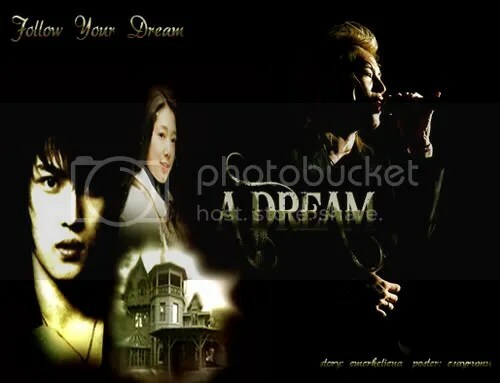 I hope that you will be able to find whatever it is you’re searching for,” the old man uttered to Jaejoong. Jaejoong was already staring at the site that immediately melted his heart. Even if his mind had already forgotten, his heart was still able to remember. “Lena what are you doing?” Jaejoong asked as he lovingly embraced her. “I am making several designs for our future house,” she replied with a laugh. Jaejoong carefully looked at the painting that she was currently making. “This is a great design and so are the others. You should try to post them online. You might never know… Someone might actually like your designs and paintings and buy them,” he said with a smile. “You think so? And what would I do with the money? I know,” she suddenly said with a beautiful smile on her lips. “Secret,” she then replied with a laugh. Tears were already streaming down Jaejoong’s face as he continued to click on the mouse. He was looking at the paintings and designs that Lena had made. He remembered all of it. He had watched Lena as she spent countless nights making them. He suddenly stopped… and started to think… all of her paintings were sold and bought…5 years ago. “Hyung, where did this money come from?” Jaejoong asked his friend after seeing the large amount of money that was placed in an envelope. “You should be the one answering that question. I just found this envelope in the mail box with your name on it,” his friend answered. “What? My name is on it?” he asked as he turned the envelope and looked at the handwriting. He couldn’t recognize the handwriting, but the name was certainly his. Jaejoong hurriedly opened the envelope and took out the note. Jaejoong stared at his friend for several minutes. “Who could have sent the money?” he continuously asked himself. “Well that money totally solves your problems. At least, you won’t need to work yourself to death for a couple of months. You can just concentrate on your training. The person that sent that money is your guardian angel,” Jaejoong’s friend said with a smile. Jaejoong slowly read what was written about Lena. Slowly… he understood. Slowly… he finally broke down into an uncontrollable cry. The anguish was too unbearable. The forgotten hatred that was locked in his heart was instantly replaced with unending guilt and shame. He shouldn’t have hated her. He should have understood her. He should have been with her. But it was too late. “I’m sorry…. I thought you just threw me away. Now I finally understand. You truly loved me. You’re my guardian angel. You’re the one who sent me that money that helped me in achieving my dream. Thank you. Now I know you sold all your paintings just for me. And… I am sorry. I wasn’t by your side when you needed me. I’m sorry,” he continuously uttered as his eyes were already blurring with his tears. “Hyung,” Max said with concern. He then slowly read what was written on the computer monitor facing him.